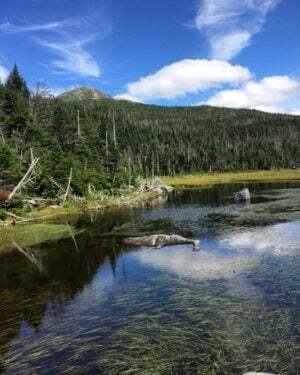 The highest source of the Hudson River sits 1,000 feet below the summit of Mount Marcy, the highest peak in New York State located in the Adirondack Mountains. A year ago, two of us here at Riverkeeper decided to go see it. At Riverkeeper our work spans hundreds of miles along the mainstem of the Hudson, into tributaries, and the communities surrounding these waterways. Our work takes shape through a diverse variety of partnerships, stakeholder meetings, film screenings, water samples, cleanups, and much more. As Riverkeeper staff, we have the opportunity to see many stretches of the Hudson River and its tributaries from Newtown Creek and the Gowanus Canal in New York City, to Rondout Creek, Saw Mill River, and the Roe Jan.
Few of us, however, have the privilege of making the trek to the highest headwaters of the Hudson River, and of summiting the highest peak in New York State in the process. 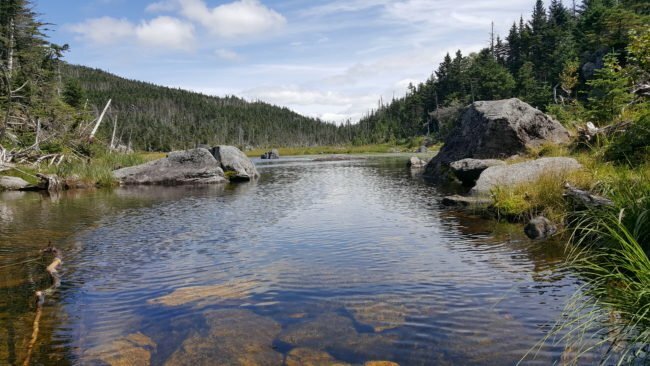 The mystery and story of a breathtaking alpine lake nestled in a mountain ridge between mounts Skylight, Redfield, and Marcy inspired us to begin planning a trip. 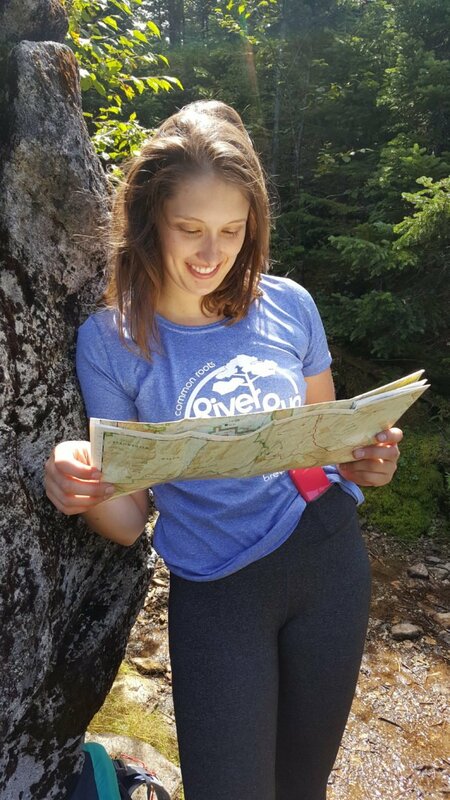 On a sunny Sunday in August, Water Quality Associate Sebastian Pillitteri and Outreach Coordinator Jen Benson undertook an 11 hour, 16-mile round trip hike to the summit of Mt. Marcy, and the headwaters of the Hudson at Lake Tear of the Clouds. 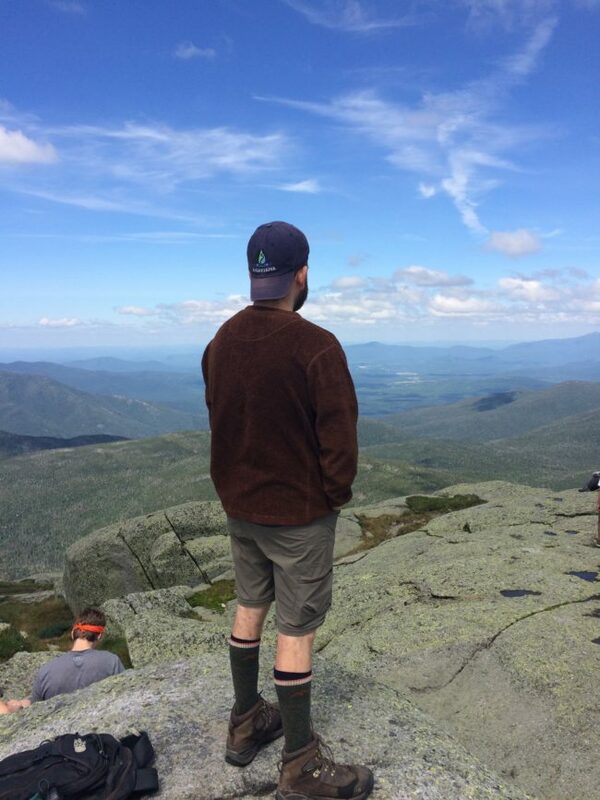 As a plaque on the summit notes, Mount Marcy is also known as Tahawus, meaning Cloud-Splitter. Tahawus exemplifies both the striking view from the summit and the known influence of mountains over weather patterns. As the clouds split, so does the watershed, as rainfall divides between the Feldspar and Opalecent Creeks, which descend from opposite sides of Marcy, until they converge in the valley below, and eventually go on to form the headwaters of the Hudson. Small streams, no more than a few feet wide at their source, flow together to become part of the vast network of streams that make up the Hudson River. The majesty and might of the Hudson stems not from one source alone, but the collective flow from thousands of other creeks, rivers, and streams. Similar to the cumulative might of the Hudson, Riverkeeper volunteers, community scientists, members, partners, and supporters unite to stand together in defense of the Hudson River. To those of us who work at Riverkeeper, Lake Tear of the Clouds represents an ideal. Our science partners documented pristine water quality in 2016 during a first-of-its-kind survey providing a 315-mile snapshot of the health of the Hudson River from the source to the sea. No samples were taken on this trip, but we were able to visit the sampling locations and take in the splendor of the source of our mighty Hudson River. Riverkeeper will analyze data from more than 5,000 water samples this summer. Support this work by becoming a Riverkeeper member. Data from the sampling project is updated monthly. Click here to explore. Note: The mountain and Lake Tear of the Clouds are on the lands of the Mohawk people of the Haudenosauneega Confederacy. Some have claimed Tahawus to be the native word for the mountains. Others suggest a European writer named the mountain Tahawus in tribute to the indigenous people whose lives and land were brutally stolen.